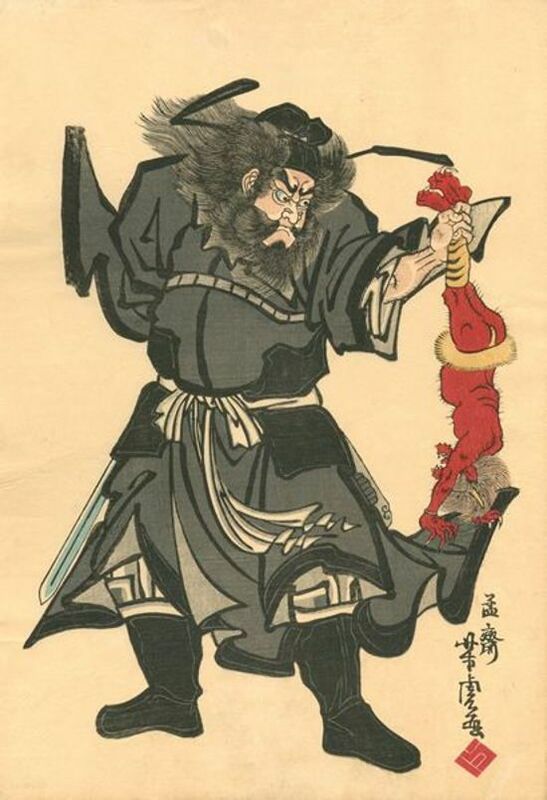 Zhong Kui, known as the Demon Queller, is a popular figure in Chinese folklore, and a very popular subject in art. Indeed, when I searched for information on him, most of the links were to paintings, and many others to the video game Smite, an online battle arena where players use traditional gods to fight against each other. The back story of this figure is that he was a brilliant scholar in Shensi who had the misfortune of being really ugly. Exactly how this is interpreted varies, but it looks like many depictions go for kind of a wild look, with unkempt hair and beard and fearsome eyes in a squarish face, more intimidating than straight-up hideous. He and his friend Du Ping took the imperial civil service examination, Zhong Kui hoping to enter the service as a physician. He scored better than anyone else, but the Emperor was put off by his appearance. See, he watched a lot of medical dramas, and knew doctors were always handsome heartthrobs. I think that’s also why you should never include your picture with a college application. In his shame, Zhong Kui committed suicide by repeatedly banging his head against the palace gates. The remorseful (or possibly just embarrassed) Emperor had him buried in state, which seems like too little too late if it weren’t for the fact that Yama, the god of the dead, also saw a lot of potential in him. He made Zhong Kui the administrator of the ghosts, and gave him the task of hunting evil demons in the living world. Not only does he fight demons, but he has forced many of them to serve him. Zhong Kui is said to have returned to his hometown after his death to celebrate the New Year, and to grant his sister’s hand in marriage to Du Ping. The wedding procession is a popular subject in art, and apparently also serves as a play on words, as “marrying off one’s sister” can also mean “subjugating demons,” at least according to the Metropolitan Museum of Art. Those four guys in New York didn’t have a tiger, did they? He was known in Japan as Shoki as early as the twelfth century, and his picture is said to be hung on eaves and rooftops in Kyoto, but not all that popular elsewhere in the country. What I’ve found online indicates that, prior to Xuanzong, “Zhong Kui” might have been an herb and/or a hammer used in exorcism rather than a person. But this guy is more fun, isn’t he? This entry was posted in Art, Buddhism, Chinese, Dreams, Holidays, Japanese, Mythology, Religion, Taoism, Video Games and tagged demons, du ping, emperor xuanzong, exorcism, ghosts, shoki, smite, wu daozi, yama, zhong kui. Bookmark the permalink.